Michael Collins (in Irish Mícheál Seán Ó Coileáin; 16 October 1890 – 22 August 1922) was an Irish revolutionary leader, Minister for Finance in the Irish Republic, Director of Intelligence for the IRA, and member of the Irish delegation during the Anglo-Irish Treaty negotiations, both as Chairman of the Provisional Government and Commander-in-Chief of the National Army. In my opinion [the treaty] gives us freedom, not the ultimate freedom that all nations desire and develop to, but the freedom to achieve it. The Treaty is already vindicating itself. The English Die-hards said to Mr. Lloyd George and his Cabinet: "You have surrendered". Our own Die-hards said to us: "You have surrendered". There is a simple test. Those who are left in possession of the battlefield have won. We have to learn that freedom imposes responsibilities. Quoted in Doherty, Gabriel and Keogh, Dermot (2006). Michael Collins and the Making of the Irish State. Mercier Press, p. 153. On January 21 they met in my room at the Colonial office, which, despite its enormous size, seemed overcharged with electricity. They both glowered magnificently, but after a short, commonplace talk I slipped away upon some excuse and left them together. What these two Irishmen, separated by such gulfs of religion, sentiment, and conduct, said to each other I cannot tell. But it took them a long time, and, as I did not wish to disturb them, mutton chops, etc. were tactfully introduced at about one o'clock. At four o'clock the Private Secretary reported signs of movement on the All-Ireland front and I ventured to look in. They announced to me complete agreement reduced to writing. They were to help each other in every way; they were to settle outstanding points by personal discussion; they were to stand ogether within the limits agreed against all disturbers of the peace.We three three then joined in the best of all pledges, to wit, 'To try to make things work'. From his earliest days Michael seems to have wanted to be the leader in everything that went on around him. His cousin Michael O'Brien wrote of him in their childhood days that Collins would always 'insist on running the show at Woodfield when we were kids, even to holding the pike (fork) when we endeavoured to spear salmon'. (There were only small trout in the river.) The family history abounds with doting anecdotes of the young Collins. Celestine, going away to be a nun in England, recalls the little boy waving goodbye until the pony and trap took her around the bend and out of sight. Mary tells of being left to look after the household for a day of drudgery during which she forgot to dig the potatoes until evening. Wearily forcing herself to the kitchen garden she was met by her three-year-old brother dragging behind him a bucket of potatoes that he had somehow managed to dig up by himself. Johnny remembers his prowess with horses, in particular, being found one day while still a baby curled up fast asleep in a stable between the hoofs of a notoriously vicious animal. His father on his deathbed told his grieving family to mind Michael because, 'One day he'll be a great man. He'll do great work for Ireland.' Michael was six years old at the time. Dr. Cagney, who had served through the Great War and had 'a wide knowledge of bullet wounds' told McGarry that Collins was killed by a .303 rifle bullet. The bullet entered behind the left ear, making a small entrance wound, and exited above the left ear making 'a ragged wound' on the left side of his head. Collins' long hair hid the entrance wound. It was his fate to die, almost accidentally, in his home county, at the hands of men who admired him, in one of the most avoidable, badly organized ambushes of the period. Any one of his assailants could have fired the fatal shot. None of them would have been proud to do so. What would have happened if Michael Collins had lived? This again is a question asked incessantly in Ireland and though I have already dealt exhaustively with questions of speculation, and hesitate to weary the reader with issues which, by definition, must be totally matters of opinion, some evaluation is called for. Obviously he had a greater grasp of economics than his contemporaries and would have brought more drive, efficiency and imagination to bear upon the task of building up the country after the civil war than did anyone in any government or party that came after him. My opinion, and it has to be based purely on speculation, is that Ireland would have benefited enormously had he lived. Unlike de Valera whose talent lay in getting and holding power, Collins asked himself the question, 'All this for what? ', and tried to provide the answers. However practical or impractical his recorded thoughts may have been they were the thoughts of a still-young man, capable of great development; a man who, in the eye of the storm, was able to take time to try to plot a course for his people and his country. De Valera paused before replying to the suggestion. It had been his Karma to live a long and distinguished public life. Although he was then in his eighty-fifth year he was looking forward to a second seven-year term as President of Ireland. But he knew that before the bar of history his name and fame were inextricably linked with a man whose allotted span had been destined to be but a third of his own. He knew that the story of Eamon de Valera could not be told without that of Michael Collins. Already he had embarked on what he knew in his heart was a futile effort to influence the record for the benefit of posterity. His newspaper and political empires had published innumerable favourable articles, histories and recollections. And in the years ahead he planned to ensure that much more favourable comment and chronology would be collated and set down. He had fashioned a vigorous dialectic of de Valerism that would bulwark him against critical re-appraisal long into the future. But de Valera was a realist, a man whose doodlings on the back of documents took the form of mathematical symbols. He realised only too well that his party, his newspapers, his Constitution even, had grown out of his opposition to Michael Collins and the resultant civil war. He knew that eventually, in the truthful telling of history, two and two would make four. Torn between his own clarity of vision and the myths he had spun around himself, de Valera struggled painfully for words to express himself. Then he said, 'I can't see my way to becoming Patron of the Michael Collins Foundation. It's my considered opinion that in the fullness of time history will record the greatness of Collins and it will be recorded at my expense.' He could be right. Republican and statesman. Born in Clonakilty, Co. Cork, Collins moved to London in 1906 where he worked as a clerk in the Post Office and later for a firm of stockbrokers. While in London he became involved with the Irish Republican Brotherhood. He returned to Ireland in 1915 and fought in the General Post Office during the rising of 1916. On his release he became increasingly influential in Sinn Féin and the Irish Volunteers. He was elected to the first Dáil for South Cork and for Tyrone, first becoming minister for home affairs and from April 1919 minister for finance. In the latter function he organized the Dáil Loan which financed the republicans' alternative government. As director of organization and intelligence for the IRA he played a leading part in the co-ordination of the military campaign in the Anglo-Irish War. His intelligence network in Dublin was renowned, and he was responsible for the 'Squad' which eliminated government intelligence. His success and determination to get things done brought him into conflict with some other leaders such as de Valera and Cathal Brugha. Collins was a reluctant delegate to the negotiations that produced the Anglo Irish treaty, but accepted their outcome and was appointed chairman and minister for finance of the Provisional Government responsible for the establishment of the new Irish state. He regarded the treaty only as a means toward obtaining a 32-county republic. His conspiratorial nature came to the fore in his secret arrangement with the anty-treatyites to attack Northern Ireland while officially recognizing it. He became commander-in-chief of the Free State army when the Irish Civil War broke out, and was killed on 22 August 1922 at Beal na Blath, Co. Cork, during an inspection tour of the south. Generally seen as a man of action, he commanded great respect, admiration, and loyalty among those around him. He has been much idealized since his death, often described as the man who singe-handedly defeated the British forces. This view has been challenged in more recent writing. The widespread admiration for him has nevertheless, fuelled much speculation about what Ireland would have been like if he had lived. Such speculation emphasizes his view of the treaty as a stepping stone, his progressive social views, and his potential to reunite a divided republican movement. It was widely believed there was a reward of £10,000 for the capture of Collins, which was as much as most Irish people could then expect to earn in a lifetime. The Black and Tans, for instance, were considered well paid, but the supposed reward amounted to more than they could earn in fifty years, working seven days a week and fifty-two weeks a year. As a result there was always the danger someone might betray Collins for the money. His engaging personality won friendships even amongst those who first met him as foes, and to all who met him the news of his death comes as a personal sorrow. 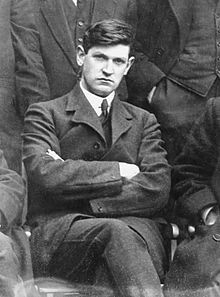 He was the man whose matchless energy, whose indomitable will, carried Ireland through the terrible crisis; and though I have not now, and never had, an ambition about either political affairs or history, if my name is to go down in history I want it to be associated with the name of Michael Collins. Collins' death can be put down to his devil-may-care attitude- his decision to journey through hostile territory in a large convoy, the inadequate choice of the members of the convoy, and the tactics he adopted in the ambush. For all the debate about ballistics and entry and exit wounds, it matters more that Collins was killed than how he was killed. Concentration on the events at Béal na mBláth has, moreover, often meant a failure to place them in the overall context of the war. The government had lost its one popular leader- the man who had made the Treaty's acceptance a probability. He has been all too easily glamourised, both by contemporaries and by historians; yet he remains, of all modern Irish national heroes, the one with whom ordinary people feel the greatest affinity. De Valera's appeal lay partly in his detachment and his remoteness; Collins, by contrast, was a back-slapper and a drinking companion. Both Cosgrave and Mulcahy were to admit that they also were vastly different characters from Collins- they could not hope to achieve Collins' personal appeal. Collins had dominated the army and government so much that he was clearly going to be difficult to replace. Though possessing much of Collins' dynamism and strength of purpose, O'Higgins was never to be remotely as popular. As Collins was only thirty-one at the time of his death, there has been much debate about whether he would have matured int a major statesman if he had lived, or whether he would have become a military dictator. He had shown considerable impatience with politicians and negotiations, often telling friends that he had little aptitude for politics. He did have definite administrative talents and great gifts of communication. He had demonstrated no desire to establish a military dictatorship. Collins had little consciousness of any need for wide-ranging social and economic change, despite being a severe critic of some aspects of Irish society. Major parts of his speeches were taken up with a simple articulation of Gaelic revivalism. Although they were genuinely alarmed about the possible consequences of Collins' death, British politicians and civil servants were to be relieved that they no longer had to deal with what Sir Samuel Hoare described as Collins' 'film-star attitudinising'. They were to contrast Cosgrave's straightforwardness and reliability with Collins' stridency. Anglo-Irish relations were to improve under Cosgrave and O'Higgins. The Northern government had every reason to be grateful for Collins' death. Collins could, perhaps, have helped to heal wounds within the Twenty-Six Counties- many believed that he would not have allowed an executions policy. He might well, however, have increased tensions between North and South in the post-war period. Meanwhile, for many old volunteers in the army the loss of their leader meant that their position appeared to be threatened, and it increased their fears that the old republican ideals were to be ignored. Where was Michael Collins during the Great War? He would have been worth a dozen brass-hats. I was allowed to paint him in death. Any grossness in his features, even the peculiar dent near the point of his nose, had disappeared. He might have been Napoleon in marble as he lay in his uniform, covered by the Free State flag, with a crucifix on his breast. Four soldiers stood around the bier. The stillness was broken at long intervals by someone entering the chapel on tiptoe, kissing the brow, and then slipping to the door where I could hear a burst of suppressed grief. One woman kissed the dead lips, making it hard for me to continue my work. Or come with ghosts another day. He passed the great test for any adult in that children loved him. A concern for others would be an outstanding characteristic of Michael Collins to the end of his life, and it is idle to speculate that some of the worst excesses of the civil war, perpetrated after his death, might have been avoided. There are also many anecdotes that illustrate his total absence of fear, even as a very small child. These stories, however, probably reflect the attitudes of the raconteur rather than revealing the truth about Michael; for an absence of fear is a dangerous quality and this, indeed, may have been ultimately his undoing. Certainly, the story told by his brother Johnny, of the toddler wandering off and subsequently being found asleep amid the straw on the floor of the stall housing a vicious stallion which only old Michael John could control, suggests foolhardiness born of ignorance. Astonishingly, little Michael was found curled up, fast asleep, between the animal's hooves. From the beginning Michael was targeted by the anti-Treaty faction and as the sessions wore on the issue became not so much the Treaty itself, but the personal standing of Mick Collins. In the end, and to a very large extent, the voting reflected the love or hatred for him- there could be no half measures- of the individual deputies. During the stormy sessions, Michael was for the most part calm and dignified, even stoical at times; but now and then his famous temper would explode. Strangely enough, or perhaps characteristically, what seemed to rouse his ire most of all was the inability of deputies to arrive for each session on time, there by delaying the start of proceedings. With immense forcefulness he reminded them that punctuality was a great thing. Two factors were immediately apparent: the disagreement was set to divide opinion right across the country, and if Michael were the chief target of opprobrium he was not going to take it lying down. Seldom in the history of any country has a single unlucky bullet so utterly altered the course of events. Indeed, it would be no exaggeration to say that Ireland suffers the consequences to this day. Had Michael lived, it is highly probable that he would have brought the civil war to a speedy conclusion and succeeded in healing the breach with the North, leading t the removal of partition which few politicians, from Lloyd George and Churchill downwards, regarded as anything other than a purely temporary measure in 1922. After Michael's death, however, the South had no one with the breadth of vision and the negotiating skills to tackle Sir James Craig, and as time passed, the breach between North and South widened. Michael would almost certainly have prevented the Ulster boundary crisis of 1925, with its tragic consequences for Anglo-Irish relations over the ensuing seven decades. This arose when the report of the Boundary Commission was published, revealing that not an inch of Northern Ireland was to be ceded to the Free State, despite the wishes of at least a third of the inhabitants of the Six Counties. This bombshell reopened old wounds and almost triggered off a renewal of civil war in southern Ireland. In Glasnevin cemetery Michael is at rest in the plot reserved for the dead of Óglaigh na hÉireann, the Irish armed forces, from the civil war right down to soldiers killed on active service with the UN peace-keeping forces in many parts of the world. Somehow it seems fitting that Michael lies here among the warrior dead of Ireland. And that Michael is gone. Michael, in their hour of need, why did you go? 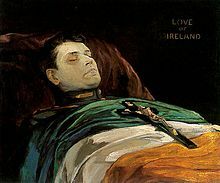 My Dear Miss Collins- Don't let them make you miserable about it: how could a born soldier die better than at the victorious end of a good fight, falling to the shot of another Irishman- a damned fool, but all the same an Irishman who thought he was fighting for Ireland- 'A Roman to a Roman'? I met Michael for the first and last time on Saturday last, and am very glad I did. I rejoice in his memory, and will not be so disloyal as to snivel over his valiant death. So treat up your mourning and hang up your brightest colours in his honour; let us all praise God that he did not die in a snuffy bed of a trumpery cough, weakened by age, and saddened by the disappointments that would have attended his work had he lived.